In the most recent accident, according to sources speaking to AIN on condition of anonymity, test pilot Matteo Maurizio suddenly lost all control of the jet. He survived the crash, but sustained serious injuries after ejecting. The aircraft in Dubai is believed to have lost all electrical power just after takeoff. Its two pilots also ejected; one was injured. The Alenia spokesman said that the two M346s were configured differently. Three separate investigations are probing the most recent accident: one is being conducted by the manufacturer, another by the Italian air force and a third by judicial authorities. The M346 has been ordered for the air forces of Israel, Italy and Singapore. Two production aircraft were delivered to the Italian air force in late 2011 and early last year for operational test and evaluation. Deliveries of 12 aircraft to the Republic of Singapore Air Force (RSAF) No 150 Squadron, based at Cazaux airbase in France, began earlier this year, although they were unannounced at Singapore’s request. The Italian air force has ordered six M346s, against a total requirement of 15. The first two have completed initial operational test and evaluation, but the latest accident has delayed a final operational test and evaluation in Italy. The Israeli air force is due to acquire 30 M346s starting next year, via a joint venture between IAI and Elbit that will provide pilot training under contract. The Singapore aircraft are also being provided under contract by a joint venture among prime contractor ST Aerospace, Alenia and Boeing. 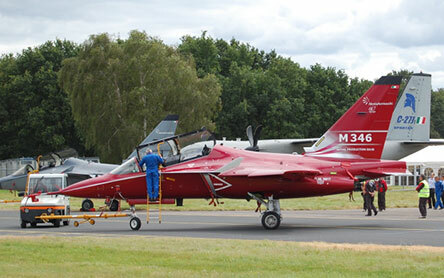 The M346 competes against the BAE Systems Hawk and the KAI T-50 in the advanced jet trainer market. In February 2009, the UAE Air Force announced that it had selected the M346, but no order was ever confirmed. The same three aircraft are being proposed for the 350-aircraft U.S. Air Force T-X requirement, although that has been delayed by U.S. defense budget problems. They will also compete in Poland, which is shopping for eight new trainers to serve from 2015.